Probable not the most politically correct movie, but then when was Takashi Miike a politically correct director? The films I have seen by this enfant terrible of Japanese film could never really be classed as making films ‘in the best possible taste’, including two films that are absolutely unmissable, Audition (1999), which established Miike’s reputation as a director who was more than willing to cross excepted boundaries, and the outrageously violent gangster movie Ichi the Killer (2001). In 2012 he made Lesson of Evil or as it was known in its country of origin Aku no kyoten which was described by Mark Player in his Midnight Eye end of year report as perhaps the directors ‘most gleefully sadistic outing since Ichi’ and compared it to other films in the great mans body of work including Visitor Q (2001), Dead or Alive (1999) and Gozu (2003). And politically correct it isn’t, being about a killing spree of pupils in a High School, something that has happened in the USA and the UK and not forgetting the mass killing of 69 participants of the Workers Youth League summer camp by the far right terrorists Anders Behring Breivik on the Norwegian island of Utoya in July 2011. The films narrative possess the question ‘do you know the difference between right and wrong’ and involves a charismatic English teacher Seiji Hasumi who charms his way into the hearts, minds and in some cases the body’s of his young charges. 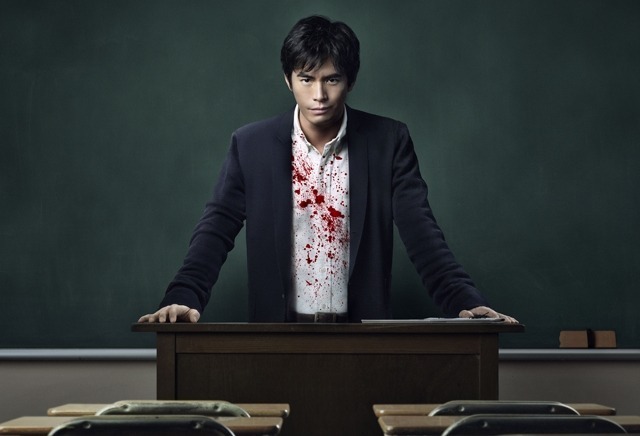 But unbeknown to both pupils and the school authorities Hasumi, played brilliantly by Hideaki Ito who had worked with the director previously in Sukiyaki Western Django in 2007, is a seasoned psychopath who is prepared to go to great lengths to solve what he perceives to be wrong with the school. Based on the novel Aku no Kyoten by Yusuke Kishi (first published serially from July, 2008 to July, 2010 in monthly magazine "Betsatsu Bungeishunju" and then published in novel form on July 30, 2010 by Bungeishunju). This is the first time that Miike has been totally responsible for a script; previously he has been in partnership with other writers. This is a profoundly violent movie but one from which you can never divert your attention even with the prior knowledge that what your watching has been panned by the critics, not because it’s a badly made or acted film, which it certainly isn’t, but because it has been deemed as unacceptable subject matter. One thing you can be sure of is that it will not be the last time Miike produces something that upsets staid cinemagoers!